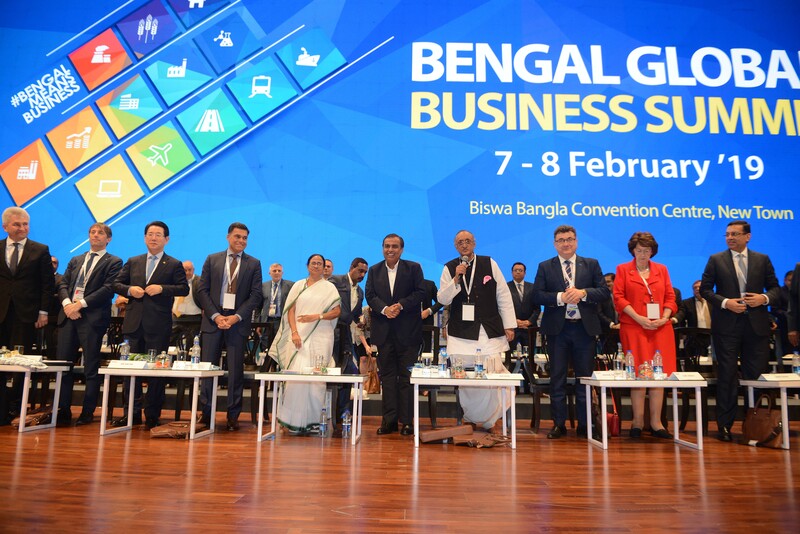 The fifth edition of Bengal Global Business Summit (BGBS) 2019 organised by the government of West Bengal attracted major business tycoons from all over the country and saw participation of over 450 international delegates from 35 countries including the United Kingdom, Germany, Italy, Poland, Japan, UAE, Czech Republic and France. 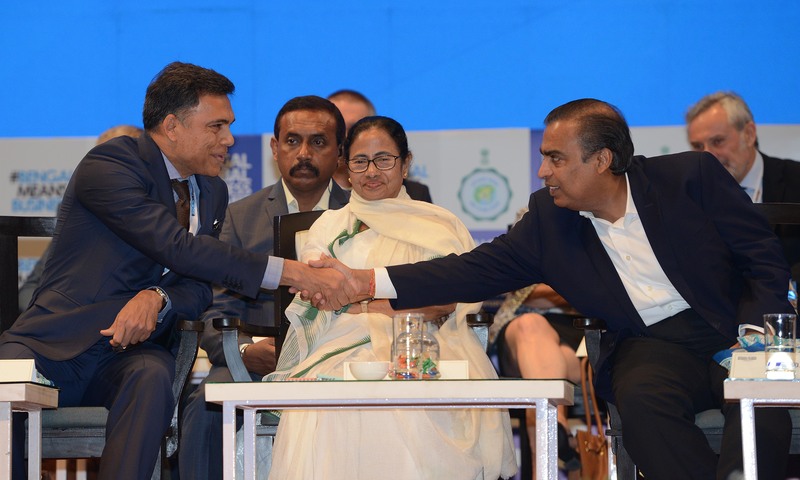 With its tagline ‘Bengal means business’ , the Bengal Global Business Summit 2019 saw industry heavyweights announce investments worth billions of dollars in the state. The major focus of the summit was to display the state’s pro-business environment and offer business partnership opportunities to the global community. A total of 86 MoUs were signed with a commitment to invest INR 2.84 trillion (USD 40 billion), almost 30 pc more than the previous year. Chief minister Mamata Banerjee inaugurated the two day event (February 7-8) in the presence of major business tycoons like Reliance Industries chairman Mukesh Ambani, JSW group chairman Sajjan Jindal, vice-chairman and managing director of Bharti Enterprises Rajan Bharti Mittal and Niranjan Hiranandani of the Hiranandani group. Besides, ministers, ambassadors and business delegates from 35 countries were also present at the event. She also said that a new industrial policy would be formulated if there was a change in the government at the centre after the Lok Sabha polls later this year. “After the change in the government after elections, there will be a new industrial policy. Many industrialists have left India. I urge them to come back and invest in the country,” said the chief minister. Amit Mitra, minister of finance, commerce & industries of West Bengal, said that the government will present a “shelf of 150 investible projects” in 17 sectors before potential investors to pick and choose from. This will represent a total investment opportunity of INR 1,250 billion (USD 17.8 billion) in the state. Reliance industries chairman Mukesh Ambani announced on the first day of the event that his company will invest INR 100 billion (USD 1.4 billion) in West Bengal, a part of which would fund the company’s new e-commerce venture. “Today our investment stands at INR 28,000 billion in West Bengal alone which is one-tenth of our investment in India. We have planned a further investment of INR 100 billion,” said Ambani.In 2016, Reliance had made an investment of INR 45 billion in West Bengal. Ambani’s so-called “new commerce” venture aims to connect small merchants with his retail network and warehouses, helping them better manage their inventory. It already has more than 500 retail stores in the state, selling everything from clothes to groceries, and the new plan would “increase manifold” its warehouse space in the next 24 months in West Bengal, said Mukesh Ambani. He added that the new e-commerce platform “will bring win-win benefits to consumers, retailers and producers” and help 30 million small shopkeepers. He also announced that RIL will set up a chair in the Calcutta University to honour noted physicist, Satyendra Nath Bose. Sanjiv Goenka, chairman, RP-Sanjiv Goenka Group, said his company has invested INR 230 billion in Bengal where “the leadership is clear in decision making and the administration is outstanding and transparent. Sanjiv Puri, ITC managing director said “We are taking our total investment in Bengal to INR 17 billion.” Also YK Modi of Great Eastern Energy Corporation Ltd. (GEECL) said they would invest INR 150 billion in Bengal over the next five years. DP World, a global port operator from UAE, announced the development of Kulpi Port at an investment of INR 30 billion. Coca Cola too announced that it would invest INR 5 billion in the state. With a gross state domestic product of USD 155 billion,West Bengal is the 4th largest contributor to India’s services GDP and 6th largest contributor to the country’s manufacturing GDP. With the implementation of business-friendly policies and execution, the state’s state per capita GDP annual growth rate has more than doubled from 4.8 pc in 2015-16 to 10.36 pc in 2017-18. Amit Mitra, said that approximately 40 pc of the total investment intentions the BGBS received so far are under various stages of implementation. From 2015-2019, total investment intentions valued at INR 9.47 trillion and he added that IKEA is looking at its second store in the country in Kolkata. Significant multinational companies like Alstom, Accor, D P World, IKEA, Decathlon, Capgemini, Schneider Electric, Oerlikon, Metro, Sharaf Group, IBM, Dell, BT, and P&G were present at the summit. Since my young age I was thinking noting good would happened in Bengal. Then went abroad. Leaving both of my abroad I came back to Bengal after 24 years.what a commandable changes in recent years. It would be both of my sons instead of both of my.